Method(s): There is a rifle and an archery season available, all are controlled/draw tags for the hunt. 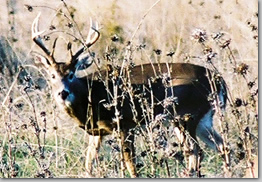 This was a new hunt starting Fall 2005. This species has not been hunted for several decades. The areas immediately around the town of Roseburg have a healthy population of this small and cagey racked whitetail. Unlike their Eastern cousin, they, like blacktails, live in various terrain and habitat and sport smaller and narrower racks. Don't be fooled though, the world record Columbian Whitetail scores in the 150's. This hunt is very very limited, part of the controlled hunt process, and will take a few years of preference points to draw. If you are so lucky, you will have a difficult time finding public lands to hunt that have sizeable numbers of deer. The hunt boundries are in an area that is about 50% private lands, while the vast majority of the deer are on about 90% private lands. We have access to several private properties to fill this nearly once in a lifetime tag! If you can't wait, we also have Land Owner Preference (LOP) tags available.